Let me qualify: I have a VERY small kitchen. How small? Well, to be fair, I’m better off than many NYC apartment-dwellers. But I’d say I’m working with about 4 x 6 feet of floor space. I can take about two steps in either direction and get where I need to go. This can be challenging for someone who loves to cook. I’m a sprawler when I do my thing in the kitchen. I use the space I have. I spread out. I make myself at home. What makes it even more difficult is that I moved four months ago from a bigger apartment with a MUCH larger kitchen with what felt like miles of counter space and endless drawers and cabinet space and pantry space and SPACE in general. Alas…now I have been forced to adjust to my small — albeit extremely well-equipped — kitchen. 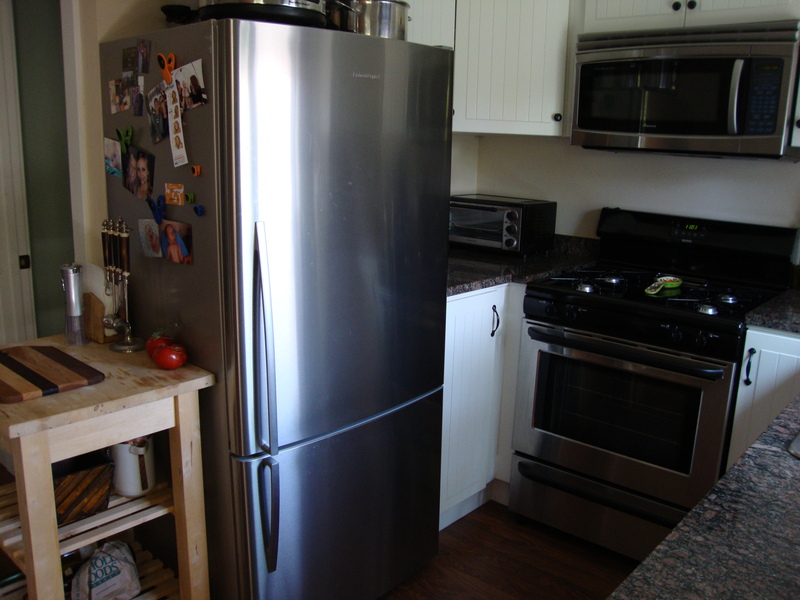 I certainly can’t complain about the stainless steel refrigerator with bottom-drawer freezer, cabinets with the cool feature that gently pulls in the drawer the last inch and my gas stove. (Confession: a gas stove was at the top of my list of must-haves in my apartment search…cooking on electric makes me cry.) But I now have three small areas of counter space in which to work — and no dishwasher. Sigh. But as Tim Gunn says, I’m making it work. And it really is a cute kitchen. Organization has been key. My Aunt Lauren, master of organization, unpacked box after box (after box!) of my kitchen stuff — plates, mugs, gadgets, pans, knives, appliances — and made sure everything fit in the limited cabinet space, and that I don’t have to use my handy step-stool too often to get to the goodies stashed on the top shelves. It was no easy task — food lover that I am, I have a LOT of kitchen tools. And while cooking still has its hiccups in my small space, I really am in love with my little kitchen. There’s just enough room for me in it, and that’s what matters. 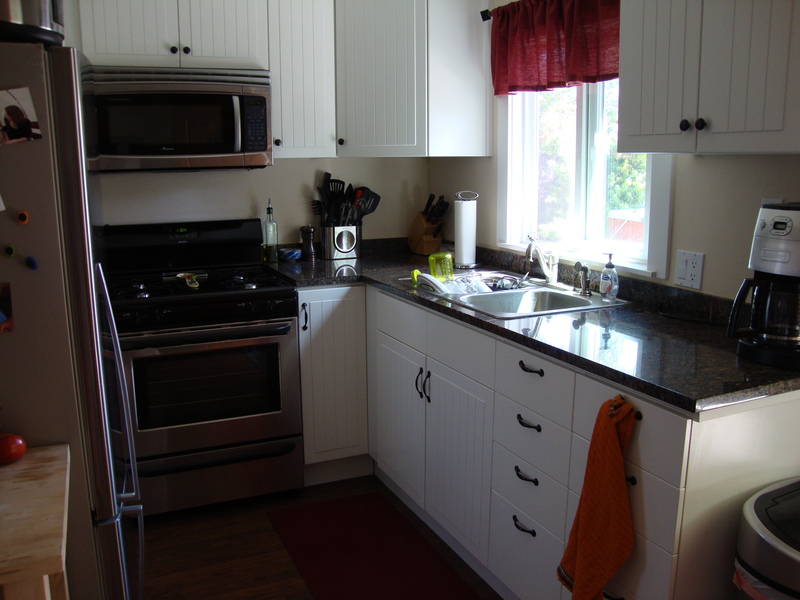 This entry was posted in Uncategorized and tagged kitchen by Tricia. Bookmark the permalink. It’s super cute! I love the cabinets! When we renovated our kitchen in our last home those were the cabinets I choose. They are ‘beachy cottage’ as I like to call them, and if your kitchen is small mine is non-existent! So it goes to leave near the beach in San Diego! Yes, very beachy cottage — I love them! Ah, small kitchens…such is life.